The relationship between Motorola and Verizon dates back to 2009 and the original Motorola Droid smartphone. Since then, the two companies have paired up for a number of Droid branded phones that are either only available from Verizon initially or are slightly tweaked models sold only by Verizon. When Motorola announced that the Moto Z and Moto Z Force will be replacing the Moto X family as the company's flagship devices at Lenovo’s Tech World event in June, it came as no surprise then that both phones would continue the Droid legacy and land exclusively on Verizon’s network first. 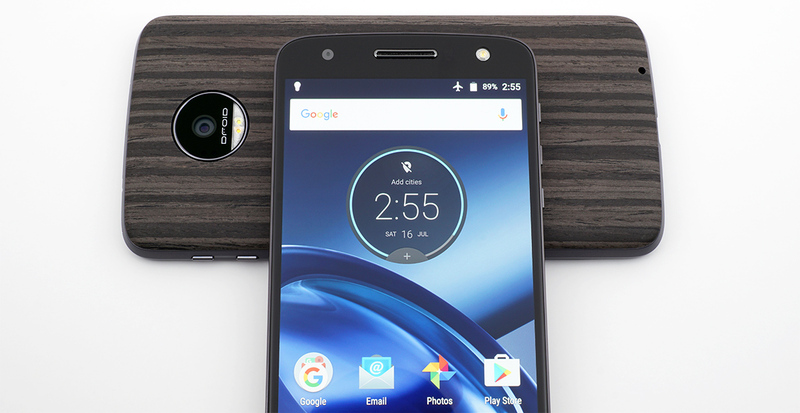 Unlocked versions of the Moto Z and Moto Z Force will be available directly from Motorola before the end of the year, but instead of waiting for the general release, we decided to go hands-on with Verizon’s Droid Editions, which use identical hardware. Just like we’ve seen with most other flagship phones from this generation, the two Moto Z Droids come with Qualcomm's Snapdragon 820 SoC and 4GB of LPDDR4 RAM. Both models have either 32GB or 64GB of UFS 2.0 NAND, although the 64GB option is only available online through Motorola’s Moto Maker website. Internal storage can also be expanded with microSD cards. The Moto Z Droids have wireless connectivity covered with Qualcomm’s latest X12 baseband processor integrated into the SoC, Bluetooth 4.1 LE, NFC, and 802.11ac 2x2 MIMO Wi-Fi. Unlike the Moto X phones, the Moto Z Droids come with a touch-based fingerprint sensor, a convenient security feature for unlocking the phone, authorizing purchases, and making mobile payments with Android Pay. So far I’ve found the new fingerprint sensor to be very reliable, unlocking the phone extremely quickly regardless of finger position. As with other capacitive sensors, it still has trouble with moisture and large changes in temperature, but its sensitivity to environmental factors is no worse than other solutions. Neither of the Moto Z Droids support wireless charging, but they do include Motorola’s TurboPower fast-charging technology, which uses the included 15W or 30W chargers to provide up to 8 or 15 hours of battery life in just 15 minutes for the Moto Z Droid and Moto Z Force Droid, respectively, according to Motorola. Another shared feature is a water-repellant nano coating that protects the phones from accidental spills or light rain, but does not provide actual water or dust proofing like Samsung’s IP68 rated Galaxy S7. While much of the internal hardware is the same, there are a few notable differences between the two models, the most significant being battery size. The Moto Z Droid comes with a 2600mAh battery, which is below the roughly 3000mAh average for phones with 5.5-inch displays. The Moto Z Force Droid bumps battery capacity to 3500mAh, which brings it close to the 3600mAh battery in Samsung’s Galaxy S7 edge. Differences in software and display efficiency will likely determine if the Force Droid can outlast the Galaxy S7 edge. Both Moto Z Droids have the same 5MP front-facing camera with wide-angle lens that uses a dedicated LED flash and automatic HDR imaging to help capture selfies over a wider range of lighting conditions. The rear cameras both have large f/1.8 apertures and optical image stabilization to improve low-light image quality, but they use different sensors and autofocus systems. The Moto Z Droid includes a 13MP Sony sensor that pairs standard contrast-based autofocus with a laser to improve focus performance in low light. The Moto Z Force Droid uses a more advanced 21MP Sony sensor with deep trench isolation (DTI) technology for improved color fidelity. It also uses a hybrid autofocus system that combines laser, phase detection (PDAF), and contrast detection methods, which should provide faster, more reliable focusing performance in a variety of lighting conditions. 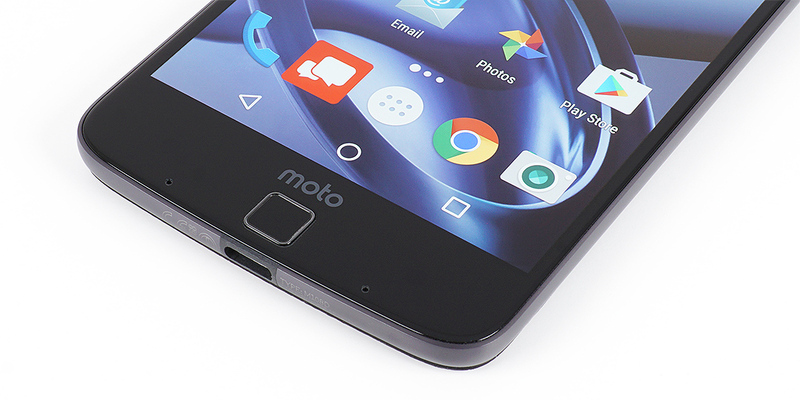 While the Moto Z Droid’s screen is covered edge to edge with Corning Gorilla Glass, the Moto Z Force Droid uses Motorola's second-generation Moto ShatterShield technology, a five-layer system that starts with an aluminum panel as a base to keep the 5.5-inch AMOLED screen from flexing. Two separate touch layers above the display provide redundancy in case one of the layers is damaged. A clear, flexible lens, likely made from a polycarbonate, is next. A second protective lens with a proprietary hardcoat completes the display stack. This assembly improves the screen's resistance to cracking or shattering if dropped, which Motorola backs by a four-year warranty. The new Moto Z Droids’ specifications and hardware are impressive but not that much different than what’s currently available with other flagships. To make its new phones more enticing, Motorola made them modular. The idea of easily swappable accessories that extend a phone’s functionality shows promise but has not fully materialized—at least not yet. Will Motorola’s Moto Z and its modular accessories, called Moto Mods, prove useful or will they just be another wacky idea that goes nowhere?